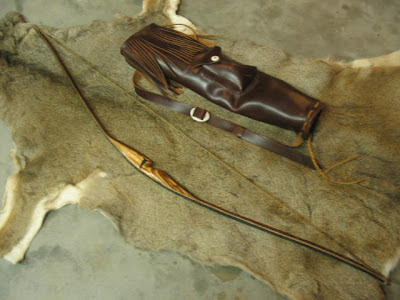 At the end of the thirteenth century when the Norman English bowmen began to pioneer the powerful new military technology of the long bow, they discovered that the more elastic and flexible a bow remained, the more useful it would be when battle came. As a result, they learned a host of new maintenance techniques—fine herbal oils to rub into the wood, leather sheaves to seal out moisture, and storage niches far from the drying effects of the hearthside. But they discovered that the very best precaution that a bowman could take for his weapon was simply to unstring the bow when it was not in use. To release the tension, relax the pressure, and relieve the strain allowed the bow to last longer, snap back faster, and set arrows to flight further. A bow that was never unstrung would quickly lose its effectiveness. A bow that was never relaxed became useless as an offensive weapon. The same principle applies to people. In order to be effective in our work, our calling, and our destiny, we need to be fresh, rested, and ready. In particular, leaders need to know how to release the tension, relax the pressure, and relieve the strain. Leaders need to be able to blow off steam. They need to know how to laugh, have some fun, get their mind on other things, and focus on something other than the crisis at hand. Leaders need to refuel, refresh, and recreate. Unfortunately, we don’t do that sort of thing very well—especially in a time of crisis. A principled leader is likely to feel guilty for not focusing on the problem constantly. We tend to think that diligence should somehow supersede the human physical capacity. There is a time for battle, for confrontation, and for engagement. But when the clash has passed, it is essential that we learn how to relax. A bow that remains perpetually strung loses its elasticity—and thus, its effectiveness. Marriage, family, and friends ground us, secure us, and preserve us. Faith, hope, and love are the things that matter most.